This is an informational page about the on-going project Graphic History: A Database for Graphic Novels about History. Supported by a Carnegie-Whitney Grant from the American Library Association. Graphic History seeks to create an authoritative, annotated, searchable database of available/in-print graphic novels dealing with historical settings, events, or people. The project will target a broad audience inclusive of general readers, instructors wishing to incorporate graphic novels into the classroom (starting at the middle school level) as well as librarians seeking to acquire graphic novels for their respective institutions. Graphic History aims to make graphic novels about historical topics more easily identifiable, promoting the circulation of included titles in libraries across the country thus expanding readership. 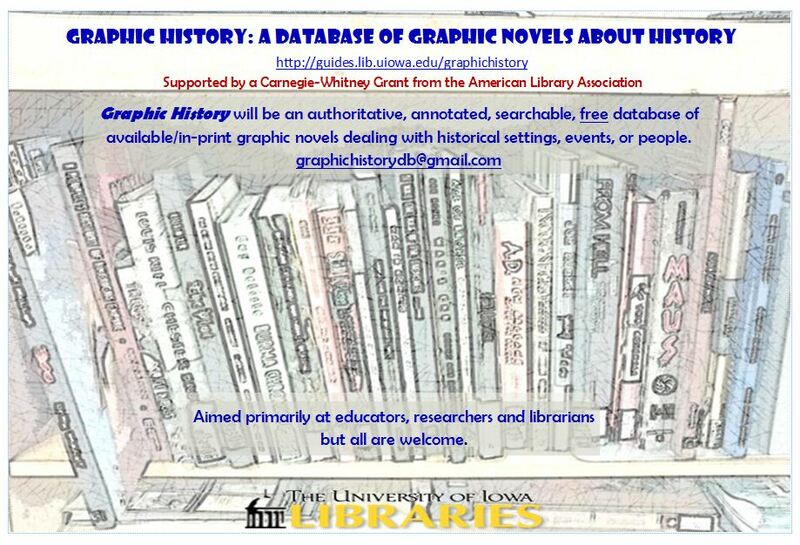 Ultimately, it is hoped that Graphic History becomes the destination website for librarians and instructors interested in graphic novels about historical topics.